Ofcom publish a database (called “TxParams”) containing details of the technical parameters of all licensed analogue VHF, MF (AM), and DAB transmitters currently on-air. The data is available on the Ofcom Website here. Using Google maps we have produced maps that display this Ofcom data for AM, FM and DAB. 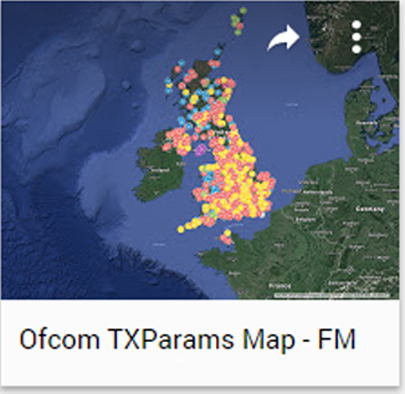 These maps will be updated as and when Ofcom periodically update their TxParams database – normally within a day or two. Scroll down to see all three maps. View each full screen by clicking on the square icon top right of each map. Click on a site to find out more.